Brexit multiple choice: How will UK parliament's indicative votes work? LONDON (Reuters) - British lawmakers will wrest control of the Brexit process from the government on Wednesday in order to try to find a majority for an alternative way forward that could break the parliamentary deadlock. WHAT OPTIONS COULD BE VOTED ON AND HOW WILL THEY BE CHOSEN? 2) A Brexit deal which must include, as a minimum, a commitment to negotiate a permanent and comprehensive UK-wide customs Union with the EU. 5) Remain a member of the European Economic Area (EEA) and reapply to join the European Free Trade Association (EFTA). 6) Common Market 2.0, an enhanced Norway-style deal which would include membership of the EU's single market as well as a customs arrangement with the EU. The options selected by the Speaker will be included on a ballot paper and lawmakers will be asked to vote "aye" or "noe" to each of them. They will be able to vote for as many of the proposals as they wish. "We will all have to seek compromise. We almost know that if we all vote for our first preference, we will never get to a majority solution," he said. "I do not believe there is a majority in favour of the first preferences of any person in this House." Lawmakers are due to take control of parliamentary business at 1400 GMT. The debate is due to end at 1900 GMT and lawmakers will then be given 30 minutes to record their votes. The Speaker can then announce the results at any time before the close of parliamentary business. It is expected after 2100 GMT. Lawmakers have set out that they plan to take control of parliamentary business again on Monday, April 1 for another debate on Britain's exit from the European Union. Earlier, opposition Labour lawmaker Hilary Benn, chair of parliament's Brexit committee, told BBC Radio this could be used to carry out a similar process again in order to further narrow down the options. The votes would not be binding on the government. May said on Monday she could not commit the government to delivering the outcome of any votes held as parliament might vote for something which was unnegotiable with the EU, or which contradicted her party's 2017 election promises. Conservative lawmaker Nick Boles told BBC TV on Monday night that if the government refused to reflect the wishes of parliament, lawmakers would bring forward legislation seeking to force it to do so. Yes. In 2003, lawmakers were given seven different options for proposed reform of parliament's unelected upper chamber, the House of Lords, but no options garnered a majority. Can somebody please tell these crooks that we have already voted. 406 constituencies voted to leave. 242 voted to remain. What is the point of a "People's Vote Referendum" if parliament tries to twist the result afterwards? There may have been some legitimate complaints by Brits about Brussels, the EU and all that. Yet, this Brexit process has certainly opened up a can of worms that makes me wonder if it is all been worth it. So much time, effort and money has been spent on it. I wonder what other important problems have been thus neglected. Plus, of course, there's been a lot of discord for quite a while now. My guess is that there are a number of people who voted for Brexit who had expected a more efficient process. Is PM May and her govt. to blame for all of this or was it just too much of an extraordinary challenge? Maybe, just maybe, a better solution would have been working within the EU to address some issues? Well, I am not that well versed on the subject. I'll let the rest of you wrangle over it, as you have already done so. It just troubles me that a country that has so much to offer is so torn up by all of this. My very best wishes for a happy and prosperous resolution to all of this! We tried and tried and so have other countries. they are incapable of reforming and want further federalisation. It is not far off the situation in the country this forum is about. making sure that the people can never have their own choice or way in the name of so called democracy. Yet, this Brexit process has certainly opened up a can of worms that makes me wonder if it is all been worth it. The concept of Brexit is a a perfectly simple idea. Stay in the EU or leave. It has been worth it just to see the way politicians behave. Brexit will not go away in my opinion and I don't believe that we will all wake up next month and say lets forget it. More information on how the EU operate has shown more and more people. People are now actually questioning what the EU does and scrutinising. this will only grow IMHO. so Brexit has been valuable for that reason. I for one can't wait for the next GE and see some of these politicians, getting what they deserve. The boot. May already told them in the commons on Monday. They are only indicative. She wouldn’t commit to acting on anything. Nearly three years and the UK still doesn't know what it wants. 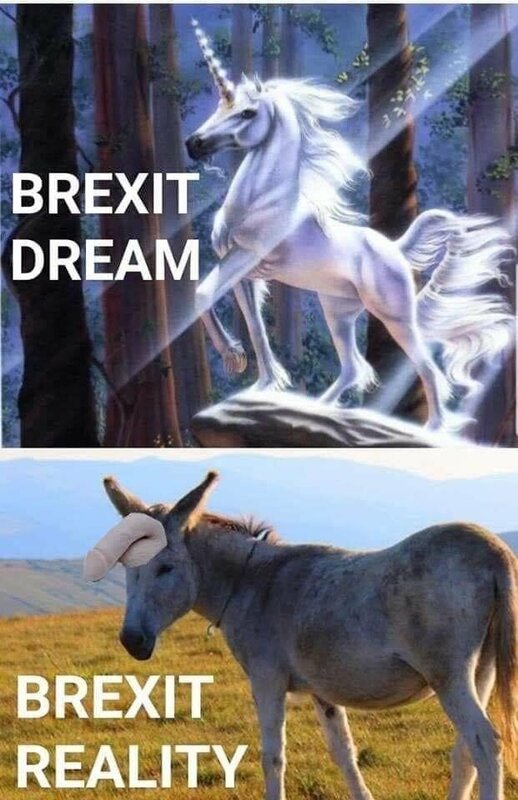 Probably there will be indicative votes that they want unicorns (but cannot decide yet on the color). Just leave and take time to make up your mind. The EU should no longer waste its time on an indecisive UK. It helps if you read the original post. "Conservative lawmaker Nick Boles told BBC TV on Monday night that if the government refused to reflect the wishes of parliament, lawmakers would bring forward legislation seeking to force it to do so." I have never seen such a complete and utter ballsup. If May or Cameron are elevated to the HoL or honoured in some other way in years to come the protests from their own side will dwarf the mickey-mouse petition seen a few days ago from the other side. Can you give a reference source for your figures please? "Why don’t we already know the results by constituency? The results of the EU referendum were published across the UK by ‘counting area’, which in most cases were local authorities with electoral registration responsibilities (single tier authorities and lower tier authorities in two tier areas). Local authorities weren’t ever required to publish the results by Parliamentary constituency or by ward (whether this is even feasible for any given local authority depends on the particular arrangements on the day). In most cases local authorities sub-divided their count process into a ‘mini-counting model’, effectively jumbling the results up and removing the possibility to get ward or constituency breakdowns. However, not all local authorities did the count this way. Some, like Birmingham City Council, counted the vote and published the results by ward and Parliamentary constituency. Northern Ireland was one counting area, but also published the results of the referendum for each of its 18 constituencies. Because of the lack of local results for the EU referendum, many commentators have used estimates published by Dr Chris Hanretty of the University of East Anglia when talking about constituencies. Dr Hanretty used a model to estimate the results of the EU referendum for Parliamentary constituencies in England, Wales and Scotland. The model was built by first examining the relationship between the demographic characteristics of local authorities and their referendum results, and then estimating what the results may have been within each constituency given its demographic characteristics. The estimates produced by Dr Hanretty are therefore an indirect way of estimating what the results by constituency may have been. The actual results at constituency level may have been different from what Dr Hanretty’s model predicts, in that the relationship observed between demographics and voting patterns at the local authority level may not hold for individual constituencies. Over 5 million people sign a petition you don't like so you deem it Mickey Mouse! Over 1 million protesters march against Brexit. Meanwhile Farage was pictured preaching from an open top bus to the appreciative Brexit supporters - all 242 of them. Outside a pub, naturally. Do you think the EU are "wasting their time" as you put it out of some love of Britain, philanthropy or humanity? Wake up! They need the UK's cash. Nothing more, nothing less. You think there will be some bona fide alternative party suddenly springing up with excellent candidates to challenge the Tory and Labor muppets currently mucking the country up? I doubt it. And I doubt you'll see many sacked by their local consituencies. Should I buy a Ute and Motorbike in Thailand?